In the past, most of the teachers have been tarot authors, this year they were known mostly for other contributions to the tarot field. Kevin Quigley had wowed participants previously with his reading insights and an evening session the year before. Thalassa, a former stand-up comedian and actor at Renaissance Fairs, is the long-time organizer of the San Francisco Bay Area Tarot Symposium (BATS). James Wells reads professionally and teaches in Toronto and has brought other outstanding teachers to Toronto. Thalassa and James are also known for writing tarot articles that are both practical and insightful. This year we learned, via a seven-layered spread, just what we really have to offer our querents, about reading oracularly, and all about the art of asking questions rather than delivering pronouncements in our readings. Here’s NY tarot teacher, Ellen Goldberg, reading a spread with me. Over the years, Readers Studio has expanded to include a Thursday early-evening workshop with Wald and Ruth Ann (since, over the weekend, they are totally involved with keeping things running smoothly), morning breakfast roundtable discussions, several choices of evening workshops by other participants, “celebrity” readings by current and past presenters, a fabulous selection of vendors (including Tarotgarden), and representatives from one or more publishers. At least six deck creators freely shared their process of creating decks and several had limited edition prints for sale. Besides the workshops and other sessions, the most exciting part of this event has been the gathering together of serious tarotists from all around the United States, and a sprinkling from other countries. Many of these belong to tarot discussion lists, forums and Meet-ups. For some it is the first time they’ve met face-to-face with people with whom they’ve been talking for years! For others, it’s become “old home” week, when we can visit with like-minded friends who we see only once or twice a year. 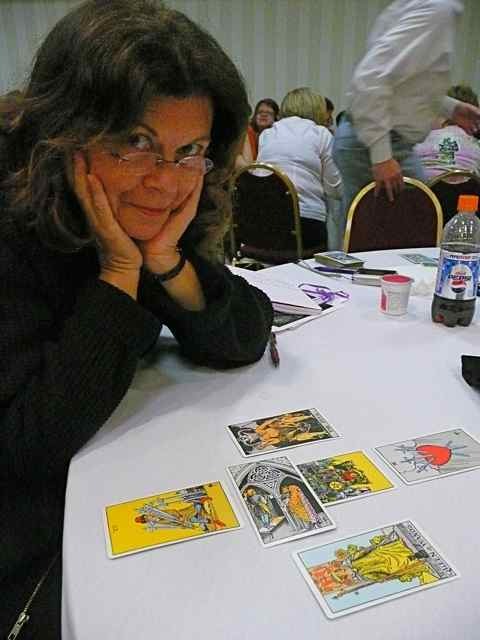 New projects get sparked, like the Teleconferences that Mary Collin initiated last year from England, an international Tarot Calendar from Amy Lamash, or this year’s “Tarot for Writers Forum,” which should be appearing any day now on the web. The most surprising phenomena is something I’ve observed at every tarot event I’ve ever attended and that’s the friendliness of the participants. I’ve never met such an overall supportive group of people before. Newcomers are welcomed—if you love tarot you’re automatically part of the in-crowd! You can pretty much join with any group of people to sit and chat. Discussions are lively, funny and interesting. Ideas and resources are generously shared. There’s no hierarchy of “experts” and “students”—we’re all practitioners of the art who want to learn more. View lots more pictures from Beth Owl’s Daughter here and Elizabeth Genco here. Also visit Elizabeth’s daily RS commentary and cool stuff on running a metaphysical business here. I didn’t talk about the Readers Studio earlier because the 140 spaces were sold out for months before the event. Next year, a larger conference room will be available as Tarot luminaries Jim Wanless (Voyager Tarot), Geraldine Amaral (Tarot Celebrations) and Rachel Pollack (too many books and decks to be individually mentioned!) will be presenting. Sign up early as this will surely be a sell-out crowd. If you are hungry for face-to-face tarot fun and learning, then check out the more intimate workshops Rachel Pollack and I will be teaching at the Omega Institute in Rhinebeck NY in June, and there’s the always popular up-coming BATS and LATS in the fall in California – more information here. Yes, the warmth and acceptance that simply spills out of everyone at Tarot events is really something… I go to a lot of events for various n’ sundry, and it’s most definitely not like that everywhere. At Tarot gatherings, everyone is on the same page and it’s incredibly easy to just relax, be yourself and enjoy. The lack of posturing is refreshing. Wonderful to see you at this fabulous event and thank you for your excellent recap. It’s been several days since I’ve been back, and I am still decompressing from this awesome experience. This was my first Tarot event on the East Coast and I had the pleasure of meeting Ruth Ann and Wald, as well as Ciro Marchetti and Robert Place, creators of my two prized possessions, the Tarot of Dreams and the Alchemical Tarot. It was exciting to be in the company of others who support and embrace the mystery called Tarot; and eagerly share it. My favorite exercise was from James Wells. How fun to see a whole room of Tarotists jump up and seek out strangers to consult with for a list breakthrough questions to ask yourself concerning a topic of personal challenge. And once shared, we weren’t strangers anymore. Powerful stuff. Take care and hope to see you at SF BATS! Blessed Be. Elizabeth – It was wonderful to get the chance to share a reading exercise with you. Love your pictures! Everyone, Elizabeth taught a fab evening session on improving your metaphysical business – I added a link to her website (with pictures) in my post above. Artemis J – It’s about time you shook off the West Coast dust and got wind of what’s happening by that other ocean. It was great to see you there grinning from ear to ear. any plans to come to the frigid midwest u.s. any time soon? i had actually planned to attend (*sighs*) but couldn’t come if i were working then i couldn’t afford to come since i wasn’t working!